STEAMBOAT SPRINGS — Five Northwest Colorado residents were arrested after an alleged drug deal went wrong. One man attempted to assault another after he tried to sell him coffee that he claimed was heroin. 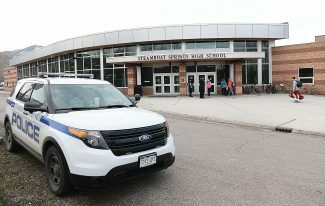 Several others face charges of child abuse because an infant was in the vehicle when two people allegedly threatened the occupants of the vehicle with a billy club and a handgun, according to Steamboat Springs Police Department Commander Annette Dopplick. Dopplick said an attempt to sell even a counterfeit drug is dangerous. According to court documents, Jessie Partlow, 34, of Oak Creek, was arrested on suspicion of selling a counterfeit controlled substance, a felony, and misdemeanor child abuse. Joseph Selbach, 20, of Craig, was arrested on suspicion of two counts of menacing and one count each of robbery and second-degree assault, all felonies. Dustin Hyatt, 41, of Craig, was arrested on suspicion of felony possession of a controlled substance, felony conspiracy to commit a crime and misdemeanor menacing. Andrew Hucke, 33, of Oak Creek, was arrested on suspicion of two misdemeanors, child abuse and violating a protection order that did not allow him to see Partlow. Shannon Rodriguez, 35, of Oak Creek, was arrested on suspicion of child abuse. As of Thursday, formal charges had not been filed in the 14th Judicial District Court. The incidents leading to the arrests occurred Dec. 30 and 31. On Sunday morning, Hucke and Rodriguez traveled to Steamboat Springs from Oak Creek to pick up Partlow from a business in the 2100 block of Curve Plaza in an Oldsmobile Cutlass. An infant was in the back seat of the vehicle, Dopplick said. A protection order that expires in 2020 did not allow Hucke to be in contact with Partlow. Surveillance footage from the business showed what appeared to be a drug deal between Partlow and Selbach. When he was apprehended, Partlow told officers he needed money and tried to pass coffee off as heroin. Partlow denied keeping the money. According to court documents, Hyatt and Selbach, driving a Nissan SUV, then pursued the Cutlass through downtown Steamboat, threatening the occupants of the vehicle multiple times. At a stop sign on Curve Court, Selbach allegedly got out of the vehicle and pounded on the door of the Cutlass, demanding money. On Third Street, the SUV got in front of the Cutlass, blocking the car, according to court documents. Hyatt and Selbach then allegedly got out of the vehicle, pulled handguns from the waistband of their pants and threatened to kill the occupants of the Cutlass. Rodriguez called 911, and dispatchers instructed her to travel to the Steamboat Springs Police Station. Once the chase ended, but before arriving at the police station, Rodriguez dropped off Partlow, who had a warrant out for his arrest. Rodriguez and Hucke told officers they had “no idea why they were being chased, nor who the two men were,” according to court documents. All three occupants of the Cutlass face charges for child abuse for knowingly bringing the baby “to what they knew to be a bad drug deal,” which threatened the safety of the child, according to court documents. “Even now, the officers continue to work zealously on this investigation to identify areas that they can support a long-term outcome for that kid that’s safe,” Dopplick said. At 11:17 a.m. Monday, Dec. 31, two Steamboat police officers were called to a fight in progress at a bus stop on Pine Grove Road. A person reported four people were fighting, with one person hitting another with a large flashlight. An SUV matching the description of the Nissan SUV was parked nearby. Hyatt later told officers that he had been taking Selbach to a restaurant. While on the way there, he saw Partlow and Hucke. Selbach then “jumped out of the vehicle” and started to fight with Partlow, according to a court document. Officers saw the SUV turn into a restaurant in the 1100 block of South Lincoln Avenue and then watched as two men, Hyatt and Selbach, walked into the restaurant. Hyatt returned to the SUV and was taken into custody. The officer then entered the restaurant. Several civilians told the officer that Selbach had run to a building in the 100 block of Anglers Drive. Dopplick commended these people for remaining cool-headed as they directed officers to the suspect’s location. Selach was located in the bathroom and arrested. According to the court document, Hyatt told officers he knew Selbach intended to assault Partlow when the pair was pursuing the Cutlass. Hyatt gave officers permission to search the SUV. Officers found a billy club, two flashlights, a handgun, two slingshots, a hatchet and multiple knives in the vehicle. Officers also seized a small amount of marijuana as well as drug paraphernalia. Officers later found a bag of suspected methamphetamine in the back seat of the patrol vehicle that Hyatt was transported in. Dopplick said the investigation is continuing. The Routt County Department of Human Services and the Oak Creek and Craig police departments assisted with the investigation.